In July of 1998, I had the very good fortune to meet and study piobaireachd with Alasdair Gillies at the Invermark College of Piping Summer School at Castleton, Vermont. 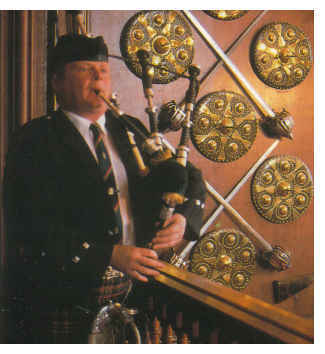 Then eight-time winner of the Former Winners' MSR at the Northern Meeting, Inverness, Scotland, he is acknowledged as one of the finest pipers in the world today. Alasdair is in demand across the country and around the world for competitions, recitals and workshops. His influence on the piping scene in North America is gradually being felt as more and more pipers come under his spell. 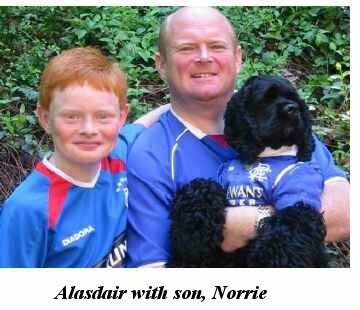 The son of Norman and Kathleen Gillies, Alasdair was born in Glasgow in 1963 and spent the first eleven years of his life there, but his Highland connections are long and strong. His father's roots were in North Uist and Raasay, and he can trace his family tree back to 1720. His mother's people were from the Isle of Mull. Norman was Alasdair's first bagpipe teacher. "And he still teaches me," says Alasdair. "I go home every year for a run through of my tunes for the big competitions. Now we're more like brothers, but I'll admit that it was a hard slog when I was a young boy. "When I was in Glasgow," he reminisces, "I was a member of the 44th Boys Brigade Pipe Band in Cardonald, and I used to go along there on a Monday night. We practiced not far from the late P/M Donald MacLeod's house. I was only nine or ten. I know I was nine when I started on the chanter. My father was the Pipe Major of the Territorial Army Pipe Band in Glasgow at that time, the 1st Battalion 52nd Lowland Volunteers, and I used to go along to that band with him as well. I actually went to the summer camp with him and played in the band. I was more their mascot, really, as I was quite young. " In 1974, the family moved to Ullapool, a fishing village on the west coast of Scotland where his father took on the position of piping instructor for the schools in Wester Ross. Alasdair became a member of the 1st Cadet Battalion Queen's Own Highlanders. Andy Venters (see The Clansman, Aug/Sept '94) was the piping instructor of the cadets, and Alasdair was a member of that band for four years before joining the army. "I thoroughly enjoyed my time with Andy," he says. "The cadets came from all over the same recruiting area that the Queen's Own had, from Elgin through to Fort William and anything north of that, so all the young lads who wanted to pipe were encouraged to join the cadet band. At one summer camp, we had thirty-two pipers in the band. It was a sizable band, and great fun for a boy. Most of the people who were in Andy's band went on to play with the Queen's Own for some period of time. At one point, there were eleven of us in the 1st Battalion Pipe Band who were ex cadet pipe band. It was not an easy job, training us, you know. We were from all over. We came together once a month for a weekend and then in the summer there was a two week annual camp where we really got the band going and performed at a few functions. The camp would be held in different locations each year. I attended twice in Edinburgh and once in Scarborough before I joined the regular army." Alasdair went straight into the army as a junior piper at age sixteen. He became the Pipe Major of the pipe band in 1992 and was serving in that capacity when the Queen's Own and the Gordon Highlanders amalgamated to form the Highlanders Regiment in September of 1994. Then he became the first Pipe Major of the new regiment's pipe band, a position he held for two years. He then moved on to the Scottish Division Depot where he was given the task of training British Army pipers to an acceptable standard before they would take their places in the army's pipe bands. He resigned from that position on 1997 to take up teaching duties at Carnegie Melon University in Pittsburgh, Pennsylvania where he also directs the university's pipe band. When Alasdair first joined the army, Iain Morrison was posted to the Scottish Division Depot as Pipe Major. "I had a lot of teaching from Iain. I used to go back to him when I was on my leaves to work with him and study piobaireachd. I did that right up until 1988 but Iain had moved back to the Isle of Lewis by then and it was getting very difficult to get the time to go there for lessons. We decided I should look for someone in the Edinburgh area to teach me and so I started going to Captain Andrew Pitkeithly in 1989. The same year, I was fortunate enough to win the Gold Medal at Oban. I studied with him until his death in 1994, so I had five very good years with Andrew." Alasdair took his Pipe Major's course at Edinburgh Castle in 1985-86 with Major John Allan. "I had already won the Former Winners' March, Strathspey and Reel by then," he recalls, "so he basically just opened up the library there and said get on with it and so I did for about seven months. Alasdair has had an eclectic pipe band experience. "Once we moved north," he remembers, "I played with the Ullapool and District Pipe Band, which my father had just gotten off the ground. It was made up of the kids he taught in the school, and it's still going to this day. I had my time with the cadets, and then with the army bands. I had a year with the City of Glasgow Pipe Band, which played in Grade 1, and I'm currently a member of the Scottish Power Pipe Band. I played with them last summer (1997) and will be playing again this summer (1998) when I go over in August. I'll not be playing at the World's but I will play with them at Cowal and at Rouken Glen, the two final major competitions of the season. Alasdair's decision to move to the United States of America in 1997 started with a comment made in the beer tent at the Argylshire Gathering. "I was not happy in the army after the amalgamation, and I didn't get the opportunity to make the best use of the pipe band. You would have thought that, with the two regiments amalgamating and the two pipe bands coming together, you'd have a really top-notch pipe band as a result, but that didn't materialize. The band was sent to Londonderry and had to fulfill a soldier's role. We were cut down in numbers to twenty-six. Things started to slide downwards for me and I wasn't getting the job satisfaction I expected with the new band. When I was moved to the depot, I lost the band forever. "I had been coming over to do summer schools in the States and I'dalways enjoyed myself and I'd go home and say to my wife, Pauline, that if there is ever a job comes along in the States I'd think about taking it. I told all this to Mike Cusack, from Texas, who is a great piper and a great friend of mine, in the beer tent in Oban, and when he went home, he contacted Jimmy MacIntosh (see Celtic Heritage, Feb/March '96) who was thinking of retiring from Carnegie Mellon. Jimmy phoned me to see if I'd be interested in succeeding him there. It didn't take me too long to decide to try for it. I was teaching in Canada for a week so I flew down to Pittsburgh for an interview and I secured the job in March, 1997. "The advertisement for the position asked for someone with at least ten years of prize-winning performances at the big competitions and also with teaching experience. You had to be of Gold Medal standard, which I was, and with all the qualification in teaching I had through the army, I sort of fitted the bill. I got the Graduate Certificate and the Senior Teacher's Certificate from the Institute of Piping when I passed my Pipe Major's course at the Castle. I presented these qualifications to the university. They accepted them and I got the job." The program at Carnegie Melon has two routes. The students can sign up for instruction one-on-one and also they can practice with the band on Monday nights. There is also an opportunity to take a four-year degree in Music with bagpipe as the principle instrument. "I would be teaching all aspects of bagpipe music," says Alasdair, "theory, history, composition and also reed making. The school is very difficult to get into, however, and the fees are high, so it doesn't attract a lot of pipers into the degree program just yet, but it is a great place to study, a great opportunity for a piper. There's no other like it in the world. At the moment, I administer the pipe band. That's my main job. I train them and take them to some competitions. We have a good time." It seems hard to believe that Alasdair feels he has always been more orientated to solo playing that band playing. 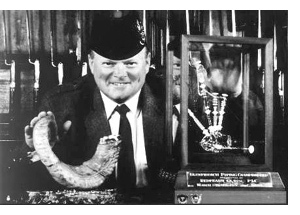 Within a year of taking up the chanter, he was competing and winning prizes. He competed in the 15-18 year old amateur events and won most of them, the National Mod, the Scottish Championships, and such like. "When I was sixteen I slipped up," he remembers. "I'd gone to the Glenurquhart Games the week before the Northern Meeting and I had actually beaten Iain MacFadyen, John MacDougall, my father, Andy Venters, and Evan MacCrae, all on the same day. So when I got to the Northern Meeting, the parents of the other kids complained that I was to play in the junior competition. The convenor ruled that as I was too young to play in the Open, so I had to play in the junior. I came second in the MSR." The following year, Alasdair was allowed to play in the B Grade where he won the marches and came second in the strathspey and reel. "That was my entry into the professional grade, at age seventeen. The next year, I was posted to the Faulklin Islands so I only managed to get to the Uist and Barra Competition in Glasgow the next March and I was fortunate enough to win the S/R and come second in the marches against people like Iain Morrison, P/M Angus MacDonald, Hugh MacInnes, and so on - the big boys of the day. In 1983, I came back and I won the A Grade Marches at Inverness which qualified me to go into the former winners. In 1984 I came second in the former winners but then I went on to win it eight times, which is a record. Donald MacLeod and Donald MacPherson both won it six times. I'm now sitting on eight and hopefully there are a few good years left in me. I'd love to get into the double figures if I could." In 1986, Alasdair won the Silver Medal at Inverness, and in 1989, he won the Gold Medal at Oban. 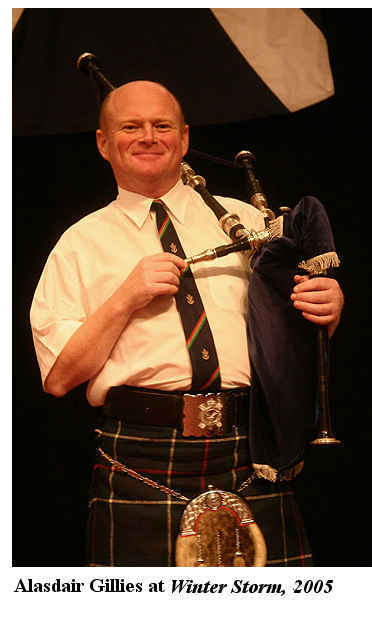 In 1992, he won both the Clasp at Inverness and the Senior Piobaireachd at Oban, and won the senior again in Oban in 1994, and the Bi-centennary of Strathclyde University Prize Pipe in 1996, taking both the piobaireachd and the light music there. He won the Donald MacLeod Memorial three times in five years, and the G.S. MacLennan Memorial in San Diego in April of 1998. He won the Glenfiddich twice, in 1991 and 1996, and was runner-up for the piobaireachd four times. He won the MSR there four times. "All in all," says, Alasdair, modestly, "I've had some good innings, I'd say." Though now based in the US, Alasdair taught briefly in Canada as a result of doing the Edinburgh Tattoo with the 2nd RCRs, the Royal Canadian Regiment, in 1996. "Their Pipe Major was a chap called Iain Ferguson. Our two bands got on great, we really clicked together. Shortly after the tattoo, Iain was posted to the School of Music in Borden, north of Toronto, and he invited me over to do a week-long course with all the militia regiment pipe majors from across Canada." In 1991 the Queen's Own played in Sydney and in Halifax during a North American tour to promote one of their recent recordings. "I had a night with Dr. Angus MacDonald who was still living in Nova Scotia at the time. He organized a great night at the Gaelic Society Hall in Sydney. I don't think our trip to Nova Scotia was a success, from the point of view of Columbia, who were hoping for much bigger crowds, but we had a great time. The people were very friendly." My summer piping camp with Alasdair was his third year with the Invermark College of Piping Summer Schools at Buzzard's Bay and Castleton. He was impressed by the number of older people who were taking up the pipes, something that doesn't happen in Scotland, and the standard of the young players is climbing in the US during the three years he has been teaching there. "The standard is getting better," he insists. "There were a lot of bands in the US that were of a much lower quality, but now there are a number of bands who are working very hard to bring up their standard of performance. More and more of the younger players are attending summer schools and getting very good instruction, and their bands are improving as a result. Piping is definitely on the rise here just now." Alasdair hopes to help continue this new trend. Update: Since the interview with Alasdair in July, 1998, he went on to win the Former Winners for the ninth time and was the overall winner at the Glenfiddich, placing first in the M/S/R and second in the piobaireachd.